On May 2 or 3, people would come to the Obara shrine 大原神社 in the Tanba 丹波 region of Kyoto to pay a regular visit and pray. On this day, the shrine made an offering of sweet ricewine to the deities and then offered this drink to the visitors with the prayer for good health. in autumn the visit was on September 23. The main deity of the shrine, Izanami no Mikoto, is believed to be a protector of the silk worms. During the spring visit, people would pick up a stone from the shrine grounds, take it home and place on the shelf where they kept the silk worms. The stone looked like a cat and chased away the mice that would threaten the silk worms. During the autumn visit, they brought the stones back and made a "thank you" donation. Ohara, Oohara おおはら【大原】, a place in Kyoto. Nowadays it is also famous as a place to pray for an easy childbirth (anzan). Obara Shrine was built in 852 in the area of Kyoto Prefecture known as Miyama today. The shrine was moved to Miwa Town in 1279. The main hall of the shrine, built in 1796, is decorated with magnificent carvings of stylized lions and phoenixes. The hall used to be a stage for Bunraku and Kyogen plays. In the hall, ema, votive picture tablets on which people write their prayers or to expressions of gratitude after their wishes came true, are on display. These colorful pictures are an interesting form of art. Every year on May 2nd and 3rd, the shrine holds a special festival. On the first day, sacred drums are played and ema pictures painted by local children are displayed. When the hall is lighted up, the atmosphere is beautiful. On the second day, the Nerikomi Gyoretsu ( nerikomi means parade) procession takes place. In the procession people wear traditional costumes and play instruments. They pull a mikoshi, portable shrine, on a cart. There are food stalls along the street and the atmosphere is quite festive. It is home to a female deity, and it extremely well known for helping pregnant women safely deliver their children and for ensuring good harvests. Since ancient times, many people, including high-ranking nobles, came to the shrine to pray for the safe delivery of their babies. 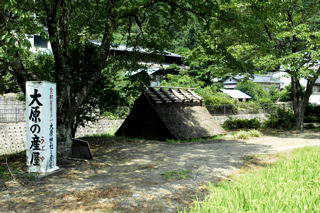 Some even came to the shrine to delivery their children in a special hut called the ubuya. When an expecting mother finally gives birth to her baby, she stays in this small hut for 7 days and 7 nights to recover. Being in the hut is said to help the mother feel free from housework or family stress. The hut was believed to be very sacred, and that the deity actually descended from heaven into the hut when the child was born. This custom was held until early the Taisho period (1912-1926). Now the hut is preserved as a valuable heritage of the local traditions. It's believed the earliest style of ubuya was a house built mainly with straw which was burned (i.e., returned to the gods) later. And the location was usually near the sea or at the foot of a mountain -- a place where the sea or mountain god could visit the hut easily. Inside the birthing hut the floor was covered with sand, just as sacred sites in Shinto are still covered with pure sand in preparation for the appearance of a god. Ubuya customs were very close to the way shamanic huts in general were built and then burned after the trance-ceremonies were finished, so, as your article mentions, the birth hut doubled as a temporary shrine in which the god -- or the soul of an ancestor -- protected and entered the baby. Before organized Shinto arose in response to Buddhism and Chinese religions, this kind of straw hut (of various sizes) may have been one of the main forms of shamanic shrine in Japan, and the birth huts basically seem to be one sub-type of shamanic (as opposed to Shinto) shrine. In Shinto most of the main priests are male, but in pre-Shinto shamanism and local shamanism that still remains to a certain extent in northern Japan and in Okinawa, the shamans were almost all women, though some musicians were male. Women were considered closer to the gods (or maybe better at trances? ), so it was taboo for men to visit the huts in which the women learned sacred songs and did trances, and the taboo originally(?) 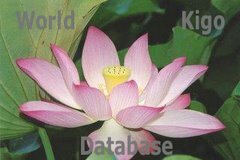 came not because women's blood was "polluted," as some Buddhists believed (including the male authors of the various versions of the Menstruation Sutra), but because women were believed to be closer to the gods and so only they were allowed to pass on the shamanic songs and trance techniques. In fact, in Okinawa, which didn't have Shinto, the word kami means both female shaman and god. Since men in Japan have been excluded from the shamanic huts by tradition, perhaps they built up their own esteem by devaluing women's blood and by turning shamanism into a more static religion -- Shinto --with male priests at the top of the hierarchy, with solid architecture, and with norito intoned prayers replacing singing and dancing during trances. At the Ise Shrine they still maintain shamanic tradition slightly, moving the most sacred building from one site to another every few years, though the old buildings are not burned, as was the case with birth and trance huts. During the festivals there is a box for people to contribute their haiku about. 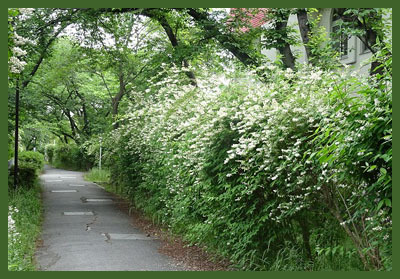 where they collected more than 350 haiku in 2008.
. Deutzia blossom (u no hana, unohana 卯の花) .